When I started out as a new blogger, my goal was always to provide great content for readers as well as monetize my blog. Unfortunately, the first few months I didn't earn a penny! I had no idea what I was doing as a blogger. I was trying to learn how to use WordPress, figure out my writing style and a whole lot of other things. When I started earning income from my blog, it didn't take me long to realize that although I was making money from ads and a couple of products I had used and recommended, I had to look at the bigger picture. How was I getting this income? The answer was easy. I was getting more traffic to my blog. More traffic meant an increase in ad revenue, as well as more opportunities for readers to see my recommended products and resources. But I had to dig deeper than this. What was the reason behind this traffic surge? Pinterest transformed and revolutionized my blog from getting a few thousand pageviews a month to tens of thousands of pageviews in a matter of a couple of months! I realized that the more traffic I was getting from Pinterest, the more my income started to increase. Over the past year, I have noticed a definite correlation between my monthly pageviews and income. 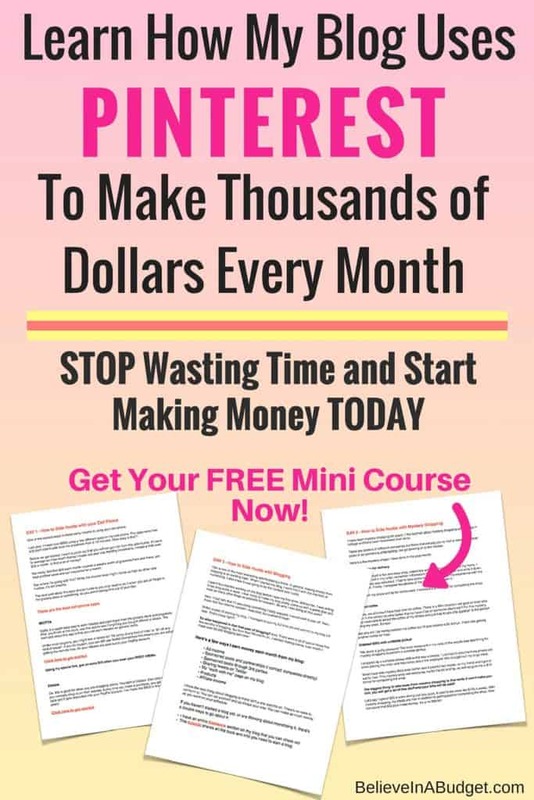 Pinterest is my number one traffic source, with a whopping 90 – 95% of my traffic coming directly from Pinterest each month. 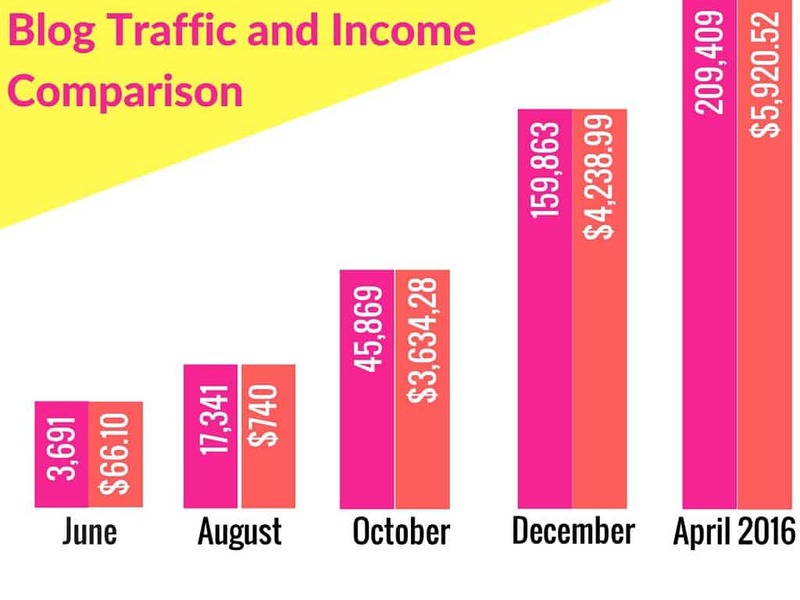 To break it down even further, here's a chart I made to show how my income increases as my pageviews increase! As you can see, there was a steady increase with my income as my monthly pageviews increased. Of course, I want to stress that there is no right or wrong amount of income you can make. There are bloggers who do extremely well with low monthly pageviews, as well as bloggers who have really high pageviews, but might choose not to monetize their website. One of the best ways I have increased my income is through my subscriber list. This was an area I did not focus on until recently, and I wish I had started this when I first started blogging. Simply put, loyal readers and my subscriber list are really valuable. 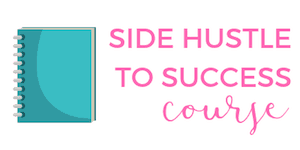 When someone reads a blog post and decides to sign up for my newsletter or opt-in to receive my free side hustle to success mini course, this means the readers likes what I am blogging about. They don't mind when I send them information in their inbox that I think would be useful for them! Using my subscriber list, I have been to increase my income exponentially. My subscribers are the first to hear about a new course, get direct access to me, a free training session and more! My subscribers make the best clients. So how does this relate to Pinterest? It's also really important to mention that I do all of this with a low amount of Pinterest followers. As of writing this blog post, I am hovering around 3,000 Pinterest followers. Do not feel like you have to have a large amount of Pinterest followers to get traffic back to your website. In fact, I even wrote a case study on how I receive over 200,000 monthly pageviews from Pinterest each month with a low Pinterest following. Ok, so now after a viewer has opted-in and signed up, what happens next? From here, a couple different things can happen. If a viewer wants to receive one of my free incentives, he or she will receive content via email for the next couple weeks. During this time, I'll educate my viewers as well as provide information about my paid course or product. When a viewer has signed up to receive my weekly newsletter, I'll also mention product recommendations, tips, my courses or free training sessions. It all depends on what I am working on at the moment. All of these things can lead to sales, which means an increase in income! What kind of free incentives do I give my viewers? This depends on what I am working on with my website. My readers are evenly split – some read this blog to learn about how to side hustle and some area here to read about the blog and business aspect of things, like how to use Pinterest, make money blogging, etc. (which circles back to side hustling). Right now I offer a couple different incentives! This includes a free mini side hustle course which is part of side hustle product I offer. I also have a free incentive for my readers who want to use Pinterest. In both instances, readers just have to sign up and opt-in to receive the material! 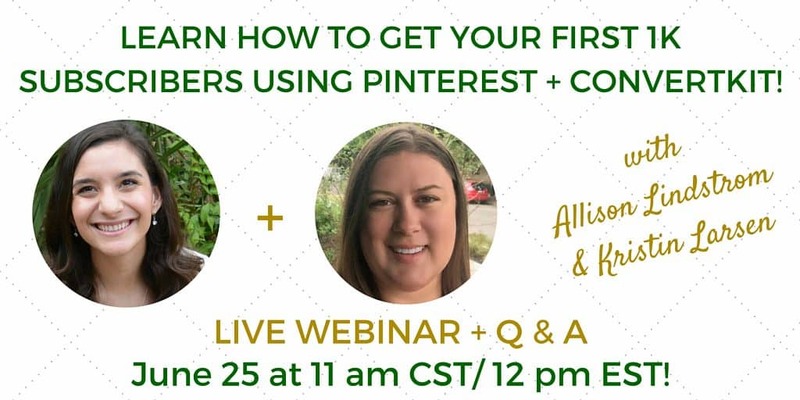 This Saturday, June 25th at 11am CST, I am co-hosting another free training session with fellow #girlboss Allison from Frugal on the Prairie. You can sign up here to watch live or catch the replay. This training session is going to teach you how to use Pinterest and how to get your first 1k subscribers. If you attended our last Pinterest training session – nearly 600 of you signed up! – you know we don't mess around. We get right down to business and review exactly what we have done to utilize Pinterest, grow our subscriber list and how you can implement the same strategies. If you aren't able to watch us live – don't worry, we know you are busy. The great thing is one you sign up, you can catch the replay for 48 hours. We'll be answering all your questions, providing step-by-step instruction and more. These training sessions are really informal and a lot of fun! Thanks! I’m beginner and i learn so much with your blog. Thanks Karine. Let me know if you have any questions! How many times a day was your blog posting content and posting that new content to Pinterest? I was posting 3x a week, but made a decision to cut down to 1x a week this year. I haven’t noticed a difference in traffic – it’s actually increasing thanks to Pinterest. I pin between 75-100x a day on Pinterest of my content. Sounds good. That’s alot of pinning to Pinterest daily of your content. 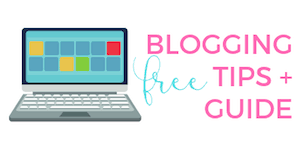 So you discovered that posting 1x weekly to your blog and 75-100x a day to Pinterest is giving you the same financial results as if you were posting 3 blogs per week? For me, I haven’t noticed a difference in posting 1x or 3x a week. Some might have a different opinion! But I rely on all my pins getting shared and clicked on in Pinterest, which means I tend to rely more on that avenue for traffic vs having a really high following on my blog. Basically – there aren’t 200K+ people waiting to see what I publish next on my blog, but there are 200K+ people that will get to my blog from Pinterest, so I don’t worry about having new content all the time! 75 -100 of your content- does that mean it’s your original content? Do you create all of the content that you pin? Can you elaborate on what and how you are actually pinning? This article was extremely helpful! Thank you! Hi Courtney! I write all my content on my blog, except for maybe 4 posts from guest writers. I also make all my own images on my site. When it comes to pinning, I play around with it some, but pin about 80% of my content (my pins) and 20% of other content (other blogger pins). This varies each week depending on how much other content I find that I like. All of my pinning is done through a scheduler like Tailwind and is automated. So I am able to plan all my pins in 1 sitting and then the scheduler pins for me to save me time! 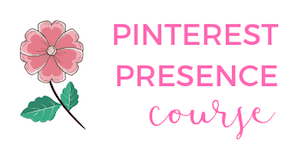 If you want, sign up for my free mini Pinterest course at the bottom of the blog post – it has a ton of tips that will help you and a lot of it goes into detail!